Given that not just one but two very different groups of people seem insistent on calling me self-promoting in my bullfighting-related activities, even though what I am actually doing is making my living as a writer with a book to sell on the subject (website of book here), I thought that I would really rile them up good and proper with the headline of this blog post. It is not lost on me, and should not be lost on readers, that one group is entirely composed of anti-bullfighting lobbyists – which is not exactly surprising – while the other is entirely composed of dyed-in-the-wool bullfighting aficionados of a certain sort. And by “sort”, I refer to a certain age – old – a certain number of corridas seen – too many – and a certain number of animals actually faced on the sand of the bullring – too few, if any. However, until my thoughts regain their order, and my hands stop shaking, I shall have to leave you with a video of my last run this year. At four minutes and ten seconds into the run, I appear from the bottom left in the blazer you see above, which appears on the video as largely red. It is actually the blazer for those who were awarded their senior athletics colours at Eton College, as I was for 400m in 1994. However, it is also, being red with white stripes, the colours of the sanfermines, meaning those who celebrate the Feria of San Fermín, patron saint of Pamplona. 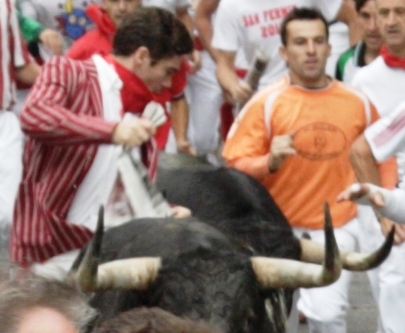 Having seen a black bull coming up through the crowd for me, I low-hurdle one fallen runner, and, abruptly but definitively remove another man crossing dangerously into my path as the horns close in on me. As I fall, the horn grazes my back, and then the bull goes over me, hooves and all. Whether it was the horn or a hoof that split my jacket, I do not know, but what I do know that anyone who truly knows me, or knows the honour I feel to run on those streets with those men and those bulls (and to drink with them afterwards)… words cannot begin to express how little my ego comes into that. The moment captured in this photo is an opportunity. No, it is more than that. It is an invitation. In the eight runs I have been in, from 2009 on, I have never seen a moment like this. All the bulls are together in a herd, being led by the cabestros, the oxen, who run the course every day, year after year, guiding and calming – to some extent- the fighting bulls who have never been in this environment before. 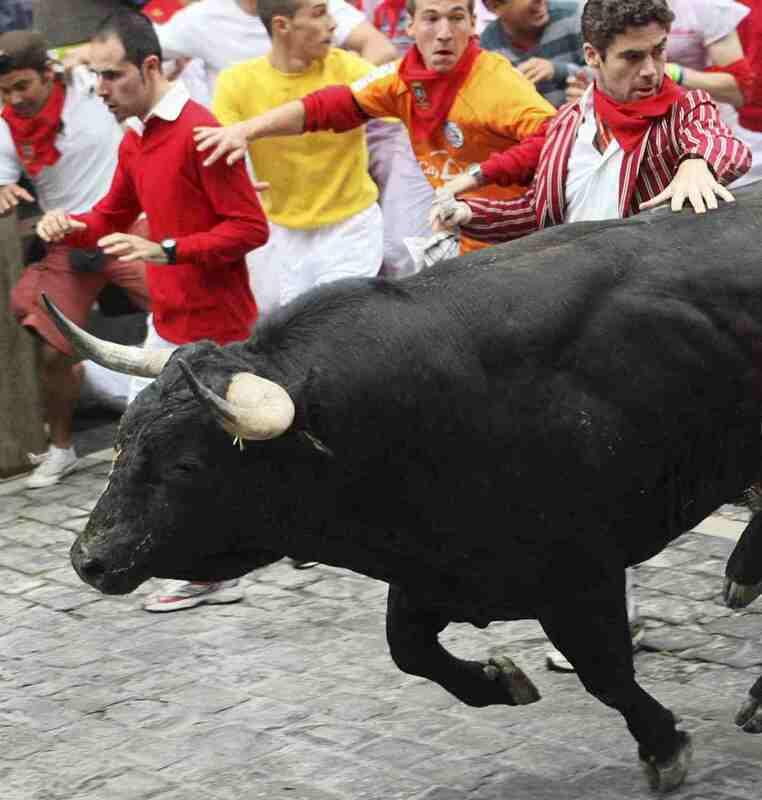 Unlike these gentle giants, the bulls have no idea who or what the runners are but tend to follow the precautionary principle of taking a swipe at anything in their path, and that can end badly in a number of ways. There is the obvious: they gore you. And there is the not so obvious, like when their horn gets hooked in a belt, and then they carry you along the street, bouncing your head on the pavement as they go. When the herd is all together like this, the bulls are far less likely to indulge in anything more than an exploratory jab or a side swipe to knock you out of the way. So, should you find yourself in a moment like this, with clear tarmac in front of you, horns behind, then run like the wind and revel in the mass thundering behind you. You are now part of the true run, the wild hunt, whose base rhythm and massive force you ride like an animal wave for as long as your legs will hold you. Then take the leap of faith – not the meaningless and dangerous jump the tourists make from the fountain – but the Navarrese dive, which is sideways and out of the herd you no longer have the strength or honour to be part of. Alexander Fiske-Harrison is an English writer and actor. 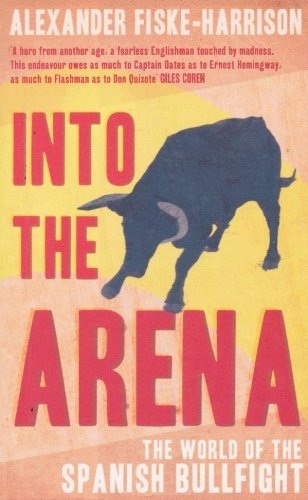 His book Into The Arena: The World Of The Spanish Bullfight is published by Profile Books and was shortlisted for the Sports Book of the Year Award 2011. 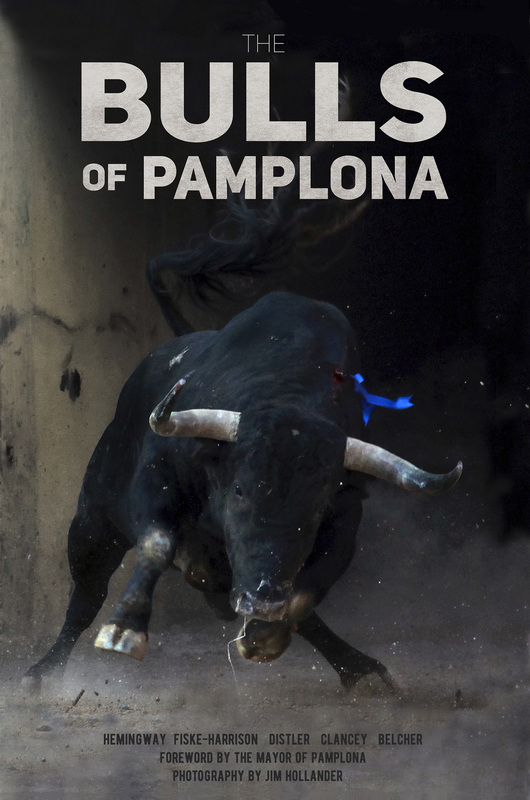 This entry was posted in Uncategorized and tagged 2012, a good run, aficionados, alexander, alexander fiske-hamilton, alexander fiske-harrison, blazer, bomber, british, bull, bull-fight, bull-fighter, bull-fighting, bull-run, bull-runners, bull-running, bullfight, bullfighter, bullfighting, bulls, corrida, encierro, english, ernest hemingway, eton, eton college, Eton School, etonian, feria, fiesta, fiske-hamilton, fiske-harrison, fitz-hamilton, fitz-harrison, gored, hurt, injured, into the arena, jacket, joe distler, john hemingway, killed, kukuxumusu, larry belcher, lori monnig, matador, mikel goni, name wrong, of the year, old etonian, pamplona, reuters, san fermin, sanfermin.com, sanfermines, school, spain, spanish, spectator, sports book, sports book of the year, sports writing, sun also rises, tauromachy, tauromaquia, the spectator, toreador, toreo, torero, toro, toro bravo, toros, trampled, uniform, warriors, william hill, world of the spanish, xander. Bookmark the permalink.